Behold, the mighty Tortas Chivas, CDMX’s answer to the NYC breakfast sandwich. “They’re all pretty big,” I said to two recent guests on a World’s Fare Eating Along the 7 food tour. 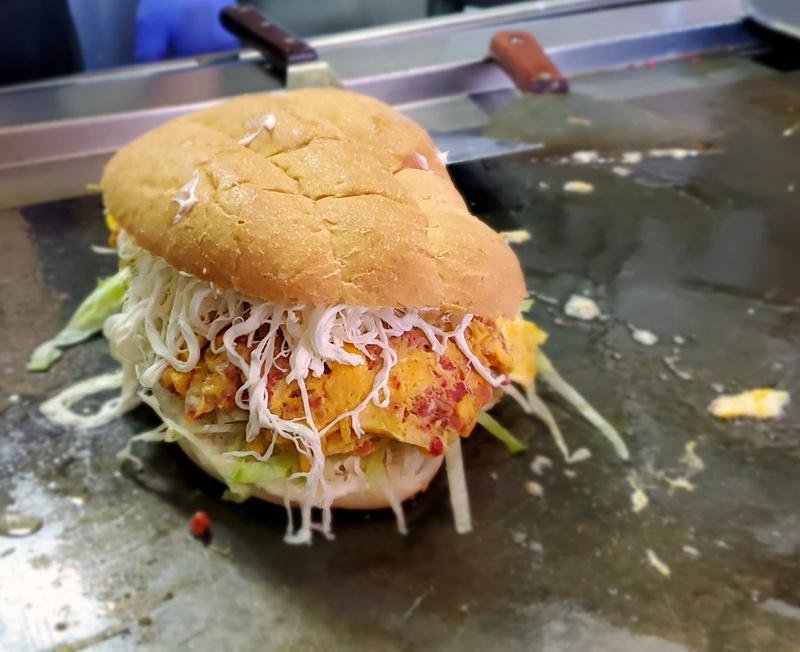 We were about an hour into our trek and had already enjoyed delicacies from Joe’s Steam Rice Roll and Soybean Chen and had just arrived at Tortas Neza, which specializes in comically huge Mexican sandwiches. I was doing my best to steer the two ladies toward a carnitas taco, but l knew they really wanted a sandwich. The gargantuan 7-ingredient Tortas Puma named for the owner’s favorite Mexican soccer team was out of the question. So I scanned the roster of 20 creations, each named for a different team, and settled on the Chivas, which listed only three ingredients: huevo, quesillo, and chorizo. Chef Pedros’ chicharron de pescado taco rocks. The pambazo in all its ruddy, messy glory. Bisteck a la Mexicana is the star of La Seleccion. “I’m sorry my friend. After tomorrow, no more tortas for you,” Galdino “Tortas” Molinero said as I perused the menu of Tortas Neza. The six-month permit for his mobile temple of tortas and fútbol runs out on Halloween, but Tortas is closing shop the day before. Sandheko wai wai, cool kids only! Thanks to Gary Stevens for turning me on to this great piece on Wai Wai, the Nepalese snack that’s become something of an obsession for me. In it the author describes how the noodles eaten raw were the province of the cool kids in his school. Nice to know I’m finally one of the cool kids. The Puma from Tortas Neza is big enough to feed your entire team. A Mexican cocktail of a different kind for Cinco de Mayo. Sometimes I’m convinced that Cinco de Mayo was invented by Cervecería Modelo to promote Corona. That’s just one reason why I’m spending it in the Bronx eating Bengali food. For those of you who don’t have plans yet or don’t like drinking frozen margaritas and dining on rice, beans, and mystery meat covered in cheese I have a suggestion. Grab a few friends and take a nice walk in the spring sunshine on La Roosie, as the locals like to call the stretch of Roosevelt Avenue that runs through Jackson Heights and Corona. Start out with a Mexican style ceviche from La Esquina de Camaron Mexicano, Roosevelt Ave. and 80th St. Watch as Pedro the ceviche mixologist fills a plastic cup with your choice of seafood: shrimp, octopus, or both. To the protein he adds a pour of a tomato-based concoction, olive oil, diced onions, avocado, salt, and hot sauce. Don’t forget to crumble some saltines over the top before digging in. If ceviche, or a “coktel,” as Pedro calls it, isn’t your thing head over to the nearby Taqueria Coatzingo, 76-05 Roosevelt Ave. for a weekend special: barbacoa de chivo, slow roasted young goat available in a taco or a platter with consommé and rice and beans. Stop by Panaderia Coatzingo next door for a cinnamon and sugar dusted concha to munch on your walk. Sweet and cold, El Bohio’s shaved ice is a harbinger of even warmer days. Morocho’s anticuchos: one of New York City’s top Street Eats. Way back in July I had the distinct pleasure of filming an episode of Street Eats U.S.A. for the Travel Channel. It was so long ago I almost forgot about it. The crew and I spent three days running around in the heat and humidity filming New York City’s finest street foods. The first two days were spent in Manhattan, which has some surprisingly good street food, especially Morocho Peruvian Fusion. Naturally we spent an entire day in Queens, with stops in Corona, Elmhurst, and Flushing. You can’t go wrong with duck for a buck. The show airs on 3/23 at 3 p.m. EST. I would be lying if I didn’t say I was excited about being on the Travel Channel, home to Messrs. Bourdain and Zimmern. I am, however, more excited that some of Queens’ greatest street vendors—Soybean Flower Chen who sells cloud-like fresh tofu; Corner 28’s one-buck duck ladies; and Tortas Neza, Corona’s undisputed king of the Mexican sandwich—all get their turn in the spotlight. Check out a preview clip here kids.